This developing neighborhood sets a new trend in modern and efficient construction techniques. These houses are built with cutting edge technologies such as geothermal heating and cooling, solar panels, and highest quality insulation materials. 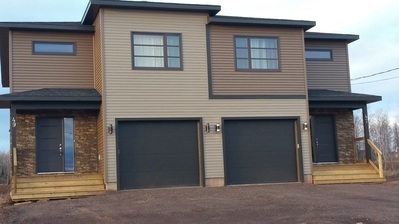 These newly built 16 units apartment buildings in Moncton North are the perfect place for outdoor enthusiasts. Close to Trinity Power Center, NBCC, Evergreen Park School, and École Le Sommet. These semi-detached houses are located in a growing and young neighborhood in Moncton North. Built to high-efficiency standards and designed with a contemporary and modern style. These duplexes are located in the perfect suburban setting in Moncton North. Built with a more traditional exterior styling, modern interior and high-efficiency standards. Perfect for the young families and professionals. Located next to walking trails, schools, and parks. Traditionally designed duplexes conveniently located in Moncton North, featuring modern interiors. Enjoy walking trails and parks in this quiet suburban neighborhood. French and English schools are close by. A short five minute drive will take you to Trinity Power Center. Quiet and private living in a uniquely built, incredibly spacious and refined 5 bedrooms house. This mature neighborhood is draped in a canapy of maple tress that will take your breath away with its multicolor Autumn leaves. Located just a showrt walk away from Birchmont Elementry School, and a five minute drive to the Trinity Power Center.